The Australian government has announced it will issue its first formal apology to Aboriginal people when parliament resumes next month. Indigenous Affairs Minister Jenny Macklin said the apology would be the first item of business when the new legislature convened on 13 February. 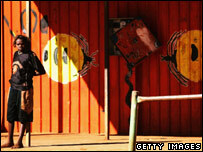 It is aimed at the "Stolen Generations" - Aboriginal children taken from their parents to be raised by white families. It was the "first, necessary step to move forward from the past", she said. Prime Minister Kevin Rudd announced plans to apologise after his victory in last year's general elections. The move is a highly symbolic one marking a definitive break from policies of previous administrations, correspondents say. Ms Macklin said that the content of the apology had been determined after wide consultation with Aboriginal leaders. It would be made "on behalf of the Australian government and does not attribute guilt to the current generation of Australian people", she said in a statement. "Once we establish this respect, the government can work with indigenous communities to improve services aimed at closing the 17-year life expectancy gap between indigenous and non-indigenous Australians," she said. Thousands of Aboriginal children were forcibly taken from their parents and given to white families or institutions to raise between 1915 and 1969. The policy was aimed at forcing assimilation between Aboriginal and white communities. Indigenous campaigners have been seeking a billion-dollar nationwide compensation package for the policy. But the government has ruled this out, instead promising to fund improved education and health care facilities for Aboriginal communities.